How do you make an MP3 into a Podcast on iTunes? very easy… first import your MP3’s into your local song library within iTunes. 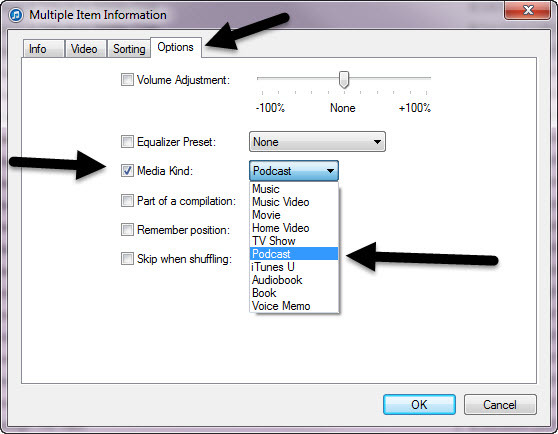 Select all the MP3’s you want to reclassify as Podcasts (and use the Podcast app). all the selected MP3’s will now be moved over to Podcasts in your library. You can now choose to sync them to your Apple device and use the Podcast app to listen. Thank you! Nowhere else have I seen it explicitly said that the Media Kind needs to be changed to Podcast. I was getting stuck/focussed on the Info tab, and missed the Options tab. Thank you, thank you, thank you. Thank you for this answer. It is much appreciated! I last tried to do this several years ago (before your post!). I don’t know whether this feature was added later or I just never found it at the time. Go to OPTIONS and MEDIA KIND and change it to PODCAST. The MP3 should now move to the PODCAST folder within iTunes.